Visiting the Eastern Most State in the USA and Falling in Love! When we left Boston, MA, we headed up the coast to Bar Harbor, Maine. We didn’t have any expectations – we didn’t really know what we were in for. I (Sonya) had heard of Acadia National Park, and wanted to visit it – but that’s about it. We really weren’t expecting much. We never expected to fall in love! 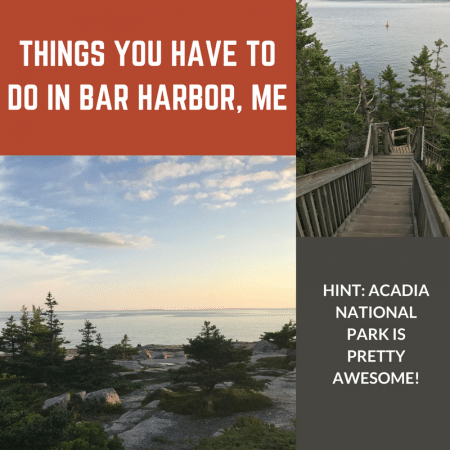 Read on for a heap of information on what to do when in Bar Harbor, Maine. For those of you unfamiliar with Bar Harbor, and its location within the USA, here you go! The drive up was pretty. Most of it was on the Interstate as it was a pretty straight shot, and roads in the North East are renowned for being narrow and windy so we tried to avoid the New England backroads in our RV. We had booked a couple of weeks at a campground called “Narrows Too” (an Encore Property through our Thousand Trails membership) near the bridge to Grand Island, which is the island where you’ll find Acadia National Park and Bar Harbor (along with some other cool places that I’ll share in a bit). Most visitors to the park only visit the main area on Mt Desert Island. But there is another part of the park (see map above) called “Schoodic Peninsula” that is just as pretty. One of the first things we did was drove up Cadillac Mountain. It is a steep climb, and gets super busy on the weekends, but worth the drive up. Parking is also limited, so patience is necessary. But the views are spectacular! You will have a 360o view of the area and we were so fortunate to pick a cloudless day! There are a few trails you can hike, and dogs are welcome (more on that later). We then took the loop drive around the park to familiarize ourselves with it. We do this a lot when we arrive at a new place. We scout the area to see what we’d like to visit and what the traffic looks like in places we would like to stop. It was interesting to see the change in terrain and scenery as we drove. Or just take a drive through the park, and stop at one of the many lookouts for a picnic, or to just enjoy the scenery! 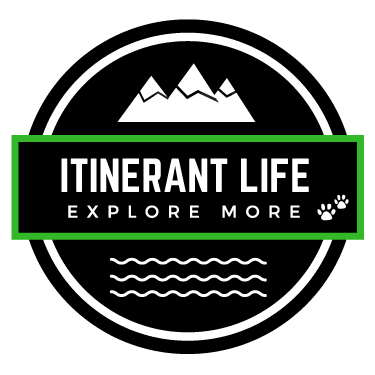 One of the things that surprised us the most about visiting Acadia National Park was the dog friendliness of this National park. We have become accustomed to having to leave our two dogs at home when visiting National Parks. But Acadia is an exception. In fact, they encourage it! And thanks to LL Bean (who own and operate the Island Explorer buses), it is really easy to come and go WITH your dogs on the Island Explorer. Our dogs thoroughly enjoyed hiking around Jordan Pond, all around Schoodic, up Cadillac Mountain and on a couple of trails within the park. I haven’t focused much on the town of Bar Harbor itself, as we only spent a short time in the town. We prefer parks and hiking. However, there was a great store called Bark Harbor that had a plethora of dog treats (and is dog friendly!) There are also a bunch of cool restaurants. And we’d highly recommend taking a walk over the spit that is walkable with a low tide between Bar Harbor and Bar Island. The entrance is on Bridge Street in Bar Harbor. It is pretty cool to walk along the sand that is only visible during low tide. There is a nice hike on Bar Island as well. We couldn’t be so close to Canada without visiting it! So we took a cooler, dreary day to take the 2 hour drive to the Canadian border, and explored all the little “Saint” towns on the other side. It was an easy drive, and a fun way to spend the day. Just don’t forget your passports! We took our dogs, and their health certificates. But didn’t need to show them. One of the most surprising things for us was the cost of seafood in Maine! We figured that because we were in the heart of lobster country, that lobsters would be cheaper! But no… not at all. They were good! Nice and fresh. But most of the ‘pounds’ (where they boil the lobsters and sell them to us suckers) sell a lobster roll (just a small roll cut in the middle and filled with lobster and served with lemon) for about $17-19. We even stopped at the less trafficked pounds, and the price was still up there. I definitely ate my fill of lobster rolls. John was happier to indulge in the local BBQ which is also fairly common. We did eat out a few times, and there are some great breweries that you should also check out. I’m not going to list them all here as everyone has their own preferences and tastes. The best pounds near the island are Trenton Bridge and Thurstons. Both have pretty nice views as well as great lobster. You can also order and ship lobster within the US. We sent my sister a box of lobster from Trenton Bridge and they loved it! There is simply so much to do in the area and never enough time! But we have decided to spend 3-4 months in Maine one summer so we can continue our exploration of the area. We didn’t expect to fall in love with Maine, but we did! Thanks Mike! We just loved it up there. I’ll be writing another post on our time in NH soon. There are some “must do” things that I’ll be sharing in that post as well. In Maine, the only thing I regret missing was staying in Lubec. We will definitely stay there next time. We had a weirdly similar experience in Bar Harbor – including staying at Narrows Too, loving Jordan Pond, hanging out with Melinda and Eryk, and wondering why all the seafood was so expensive. Exploring Acadia was definitely a highlight of our summer itinerary. Glad you guys enjoyed it too. Happy Travels! Ha! Too funny 🙂 Melinda and Eryk were awesome at giving us heaps of local info – love those guys! Happy travels to you too! Awesome, glad to hear it! If you need any info, feel free to contact us. We’re happy to help!